It’s already half way through November, and that means the holidays are just around the corner! The holiday season is typically filled with good company and good food. While indulging in a few holiday treats is perfectly acceptable, some people just don’t know when to stop. And while three slices of pumpkin pie may be satisfying at the time, chances are you’re going to regret your gluttony the next morning. So we’ve gathered a few things for you that will help you make smarter, healthier choices through the first food-filled holiday this season. Thanksgiving Day is approaching quickly. Here are the top 10 tips for eating healthy this Thanksgiving to help with over-eating, weight gain and enjoyable! Get Your Pumpkin Pie Fix — The Healthy Way! Just because you’re watching your weight doesn’t mean you need to skip out on Thanksgiving all together; Just make healthier choices. 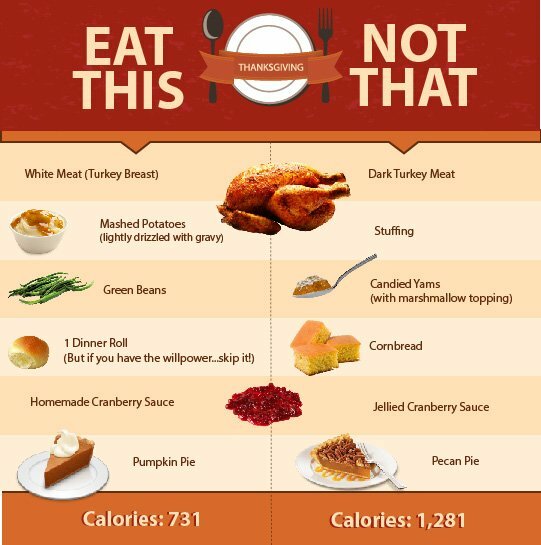 These six Thanksgiving swaps will cut out a whopping 550 calories from your dinner plate. As you may know, I have been nominated for the “Best Trainer” and “Best Alternative Exercise Option & Personal Training” awards in Arizona Foothill’s 2014 Best of Our Valley contest! You can vote once a day, per category, per email address until November 30th! Just click the “Vote Now” buttons below to put in your vote! Your participation and support is greatly appreciated.